MD – with sensors spaced at intervals of 8 mm. Each series includes modules with QTR or QTRX sensors. QTRX sensors are fitted with lenses thanks to which they achieve comparable efficiency at a much lower IR diode voltage. 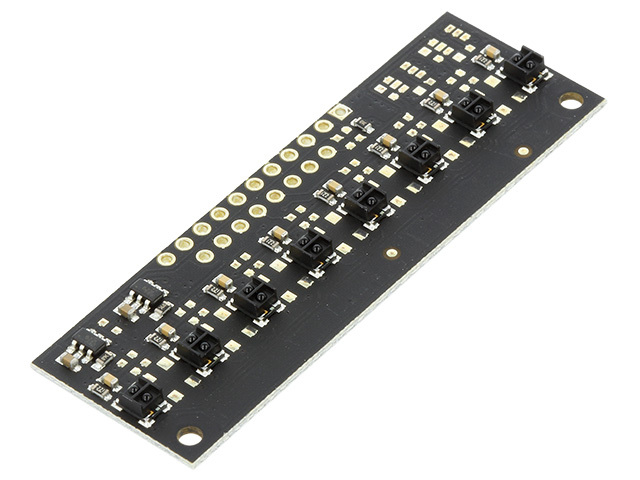 Every HD and MD module operates at 2,9V to 5,5V, with brightness adjustment that is independent of supply voltage. HD modules with five or more sensors are additionally fitted with a separate control over evenly and unevenly numbered diodes. Thanks to this solution, light reflected at different angles can be detected. POLOLU modules are available with an analogue or digital output. Outputs are independent, so only selected channels can be connected and custom sensor intervals can be set. Learn more about the full offer of reflective sensor modules.